Pickup and Delivery services can save you time and are easy for you. They start out at $150. Our service area is Marysville, Ohio and up to 20 miles away. We do offer an extended service area of up to 40 miles away for an additional $50 for a total of $195. Computer cleaned - The fans inside your computer draw in dust that can accumulate over time. The accumulation of dust can cause your computer to run hot which can effect performance and shorten the life of the components inside. We will clean the dust out of your computer. Labor to repair your computer - The labor required to repair your computer is included in this price, whether it takes 1 hour or 1 day its included in the price. Updates - We will make sure windows is up to date along with your web browser (Firefox, Intenet Explorer, or Google Chrome), Adobe Reader, Adobe Flash Player, and Oracle's J2RE ( Java Runtime Environment). Parts and Materials not included - Parts and materials needed to repair your computer will be charged in addition to this price. Rest assured though, before ANY needed part is put in your computer you will be notified what part is needed and what the cost of the part will be. You can then decide if you want to have us complete the repair or not. If you choose not to have us complete the repair, a diagnostic charge of up to $65 may apply. 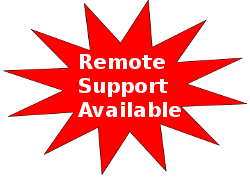 Call, text, or email us to schedule your Remote Support Session today.